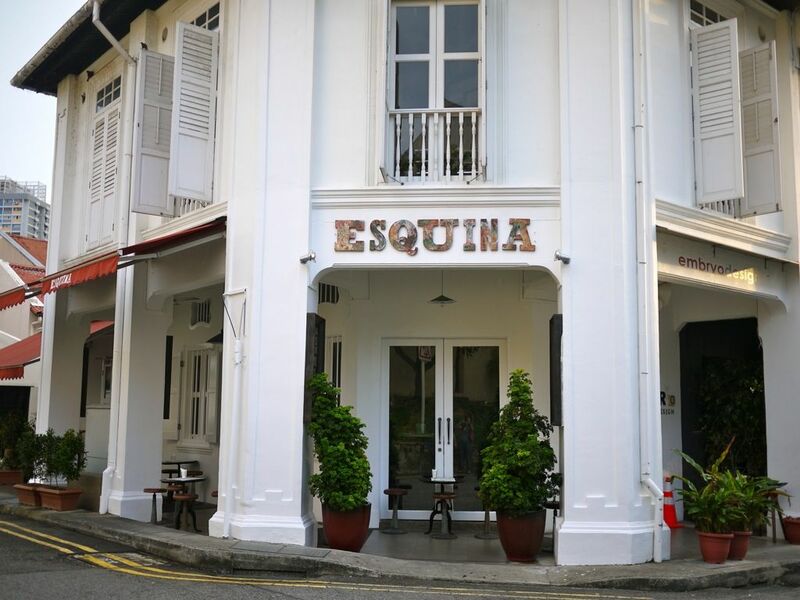 I've been dying to try Esquina for the longest time since it's like the Holy Grail of Spanish Tapas in Singapore. Well at least before Catalunya appeared on the scene. So anyway, i headed down, with a couple of friends in tow, with the aim of trying as many items on the menu as possible. Esquina is a haute tapas boutique where patrons perch precariously on weirdly shaped metal stools that will seriously damage some nuts. Not a place for large groups because you can hardly converse farther than your immediate left/right. 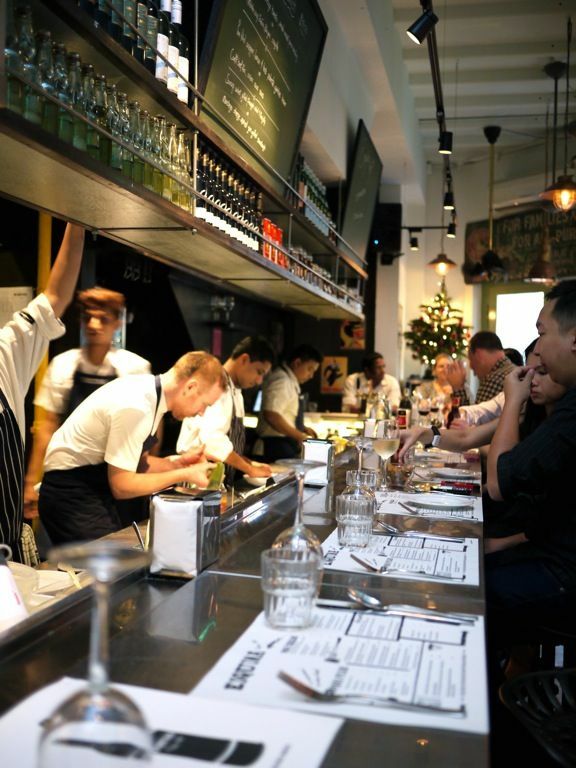 The interior is chic and industrious and the vibe no nonsense-ish unlike the friendliness at Foodbar Dada (though i was teased by the head chef when caught playing with my food). Everything goes like clockwork behind the bar and it was quite a performance for the guests. Love the order of it all. Starters: Ham Croquetas ($10) is my must order. 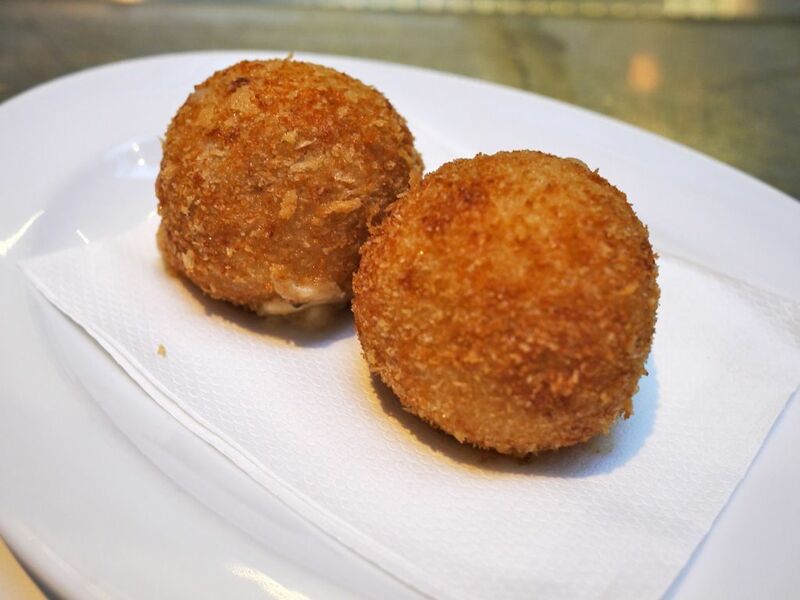 4.5cm tall balls filled with creamy bechamel and chunks of what is possibly iberico ham (i expect no less) left us wanting for more. The ham was a little salty but i love it. But i maintain that Catalunya's remain at the top spot. 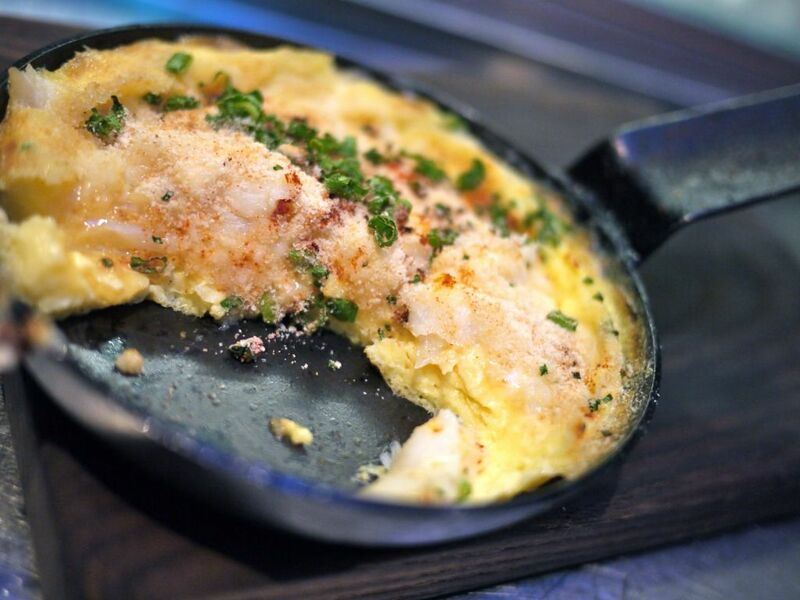 The Smoked Haddock, spring onion and Manchego omelette ($18) was the fluffiest eggs i've tried in a while. I would liken it to a souffle but firmer. The taste was light; simply flavored with the natural sweetness of the smoked haddock. I was pleasantly surprised by this one. 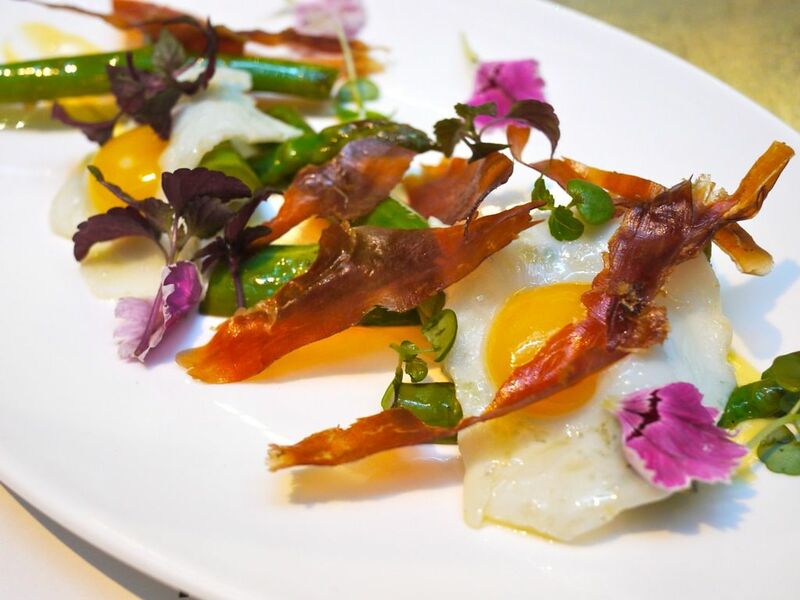 Fried quail egg, asparagus & iberico salad, truffle mayonnaise ($19). Pretty plating but nothing special. The textures and ingredients just didn't gel. Do order the Sauteed gambas, chili garlic, potato dumplings and bisque sauce ($24) even though it doesn't look spectacular. 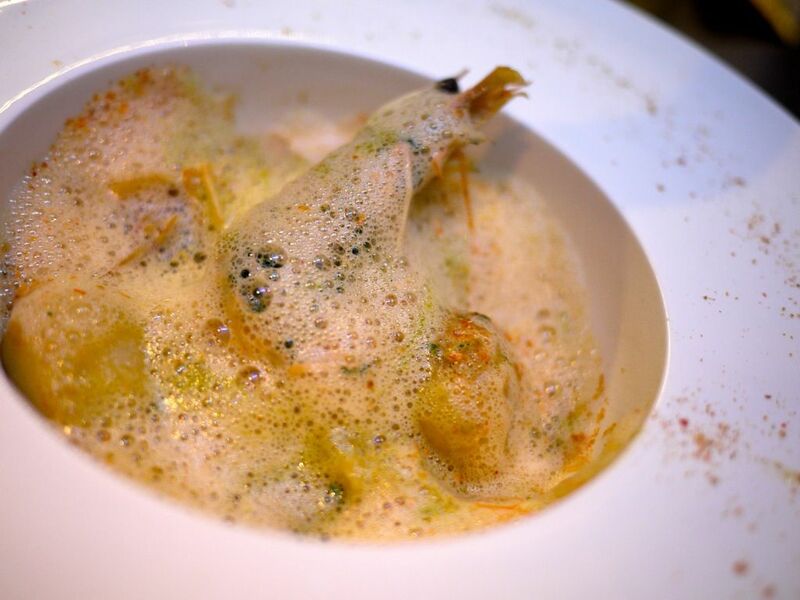 The prawns were fresh and bouncy and i love the rich bisque sauce so much i could inhale it. Gnocchi were meh. 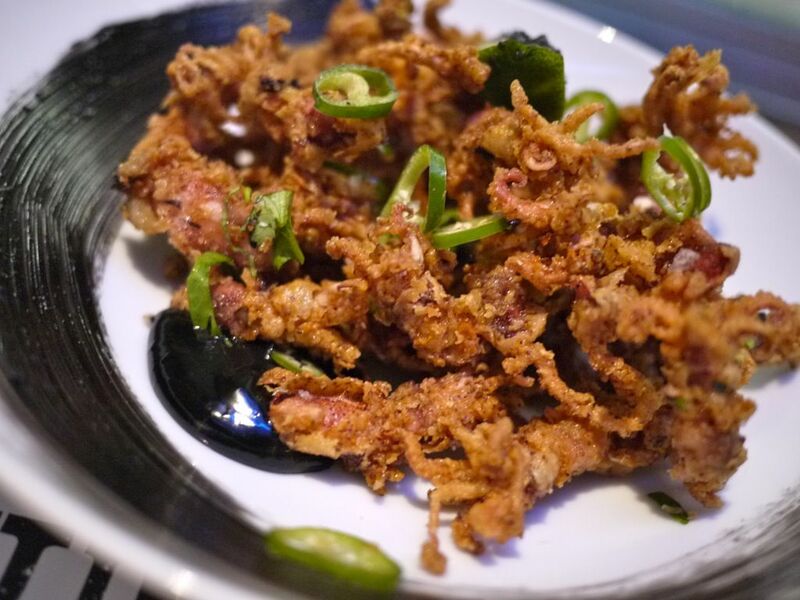 Skip the Salt & pepper squid with black ink aioli ($20). 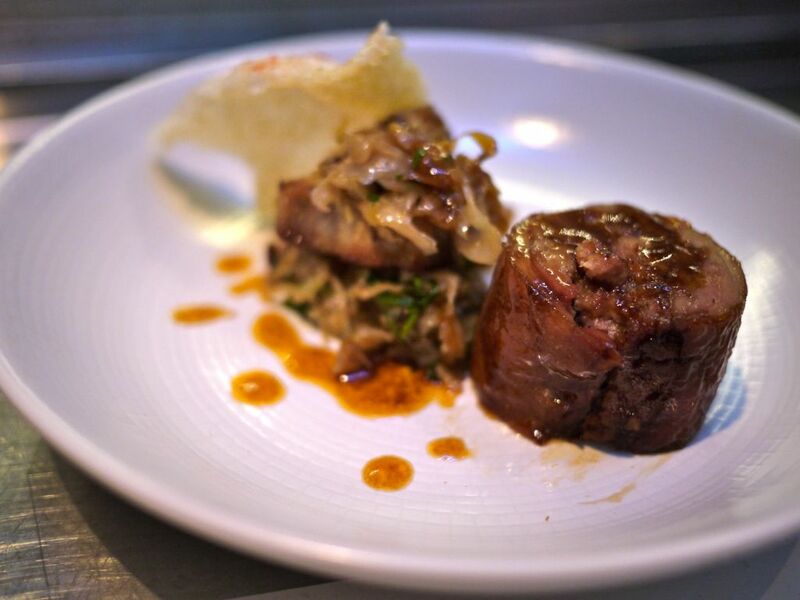 We wanted a little difference in texture and hence this dish. Certainly not worth the 20 bucks. The Meat dishes are quite faboosh. Check it out in my order of preference. 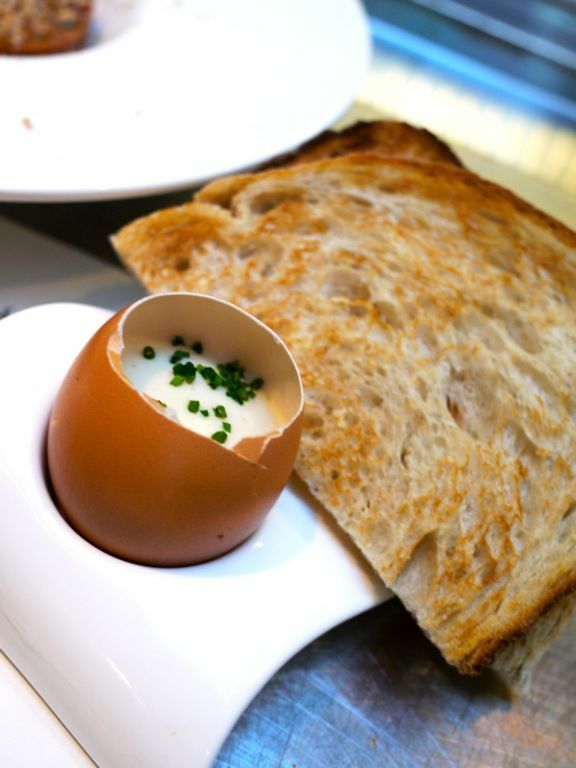 Please please please do order the Beef tartare with spicy ketchup, confit egg yolk, frozen foie gras and toast ($27). Extremely flavorful and smooth tartare, especially after you scoop the confit egg yolk onto it. The taste and texture are simply sublime, especially when coupled with the crunchiness of that yeasty toast. Craves. 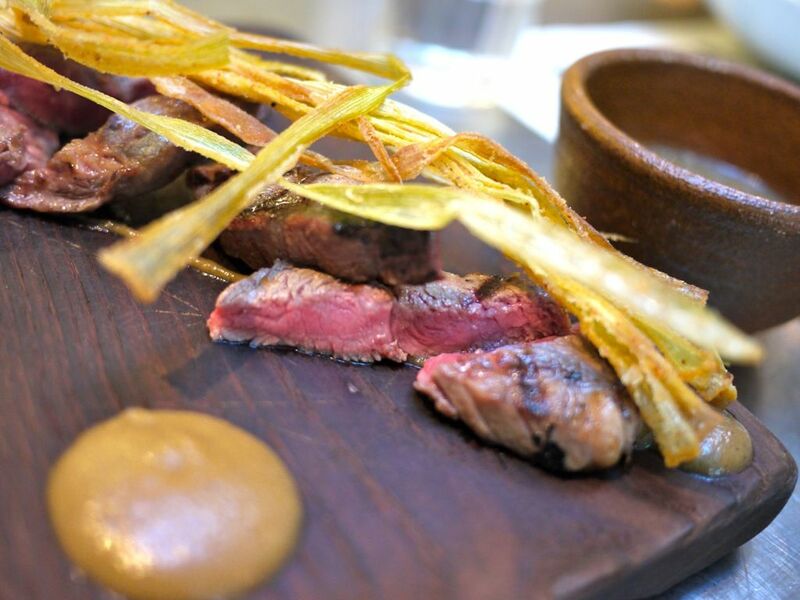 The Grilled rib-eye with spice aubergine puree, served with lentil pearl barley dhal ($39) is also superb. The meat is so good you don't need any of that fancy sauce to go with it. In fact i thought the sauces overpower the natural goodness of the red. Medium rare ftw. This is a dish i will never share again, same goes for the tartare. 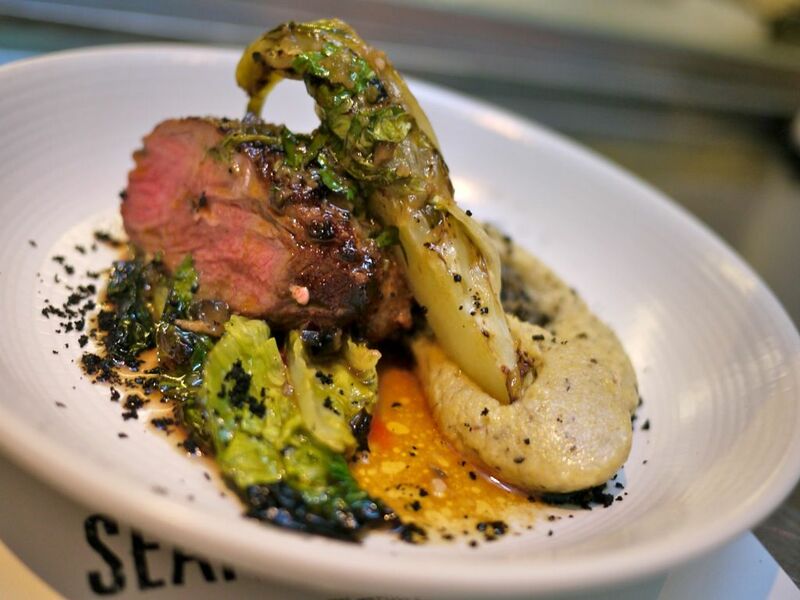 The Roast lamb rump with black olive polenta, baby romaine and anchovy chimichurri ($27) was another good dish. The meat portion would suffice as a main course for a small eater. None of that gaminess in the meat. I thought the polenta with anchovy chimichurri was a tad too salty. 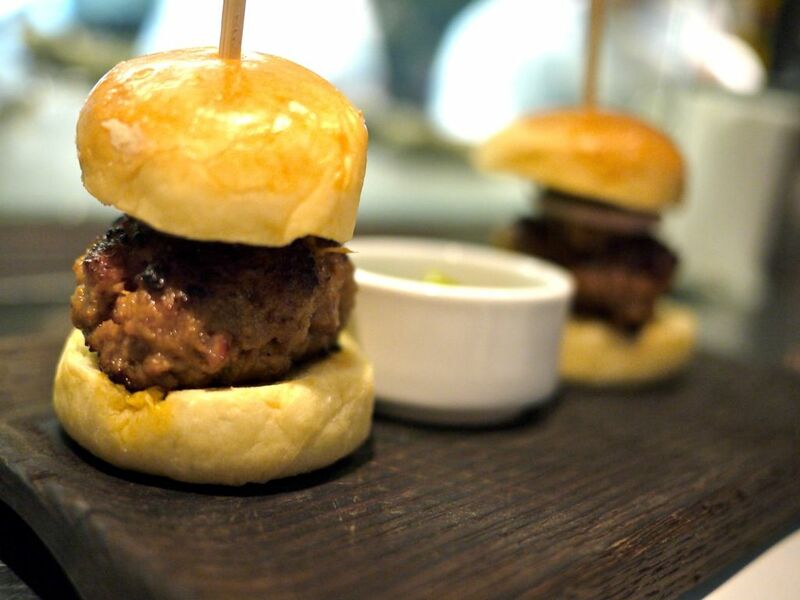 I know how everyone has been raving about the Iberico pork & foie gras burger ($27) but you would need a huge pitcher of water to wash down all that saltiness from the patty. There isn't enough bun to tone down the sodium of that pork and needless to say, i couldn't taste any of the foie gras. Roast suckling pig, iberico belly, crispy skin pickled vegetables and pig gravy ($33). 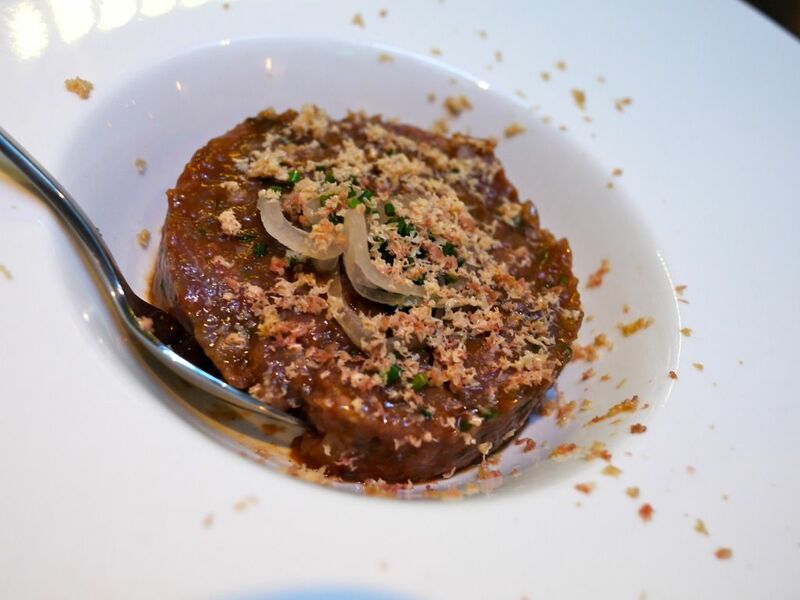 If you are afraid of the porcine taste, you may want to skip this one. It's quite a heavy dish to finish on your own due to that porkiness. That said, the tender meat and semi solid fats may win itself some fans. 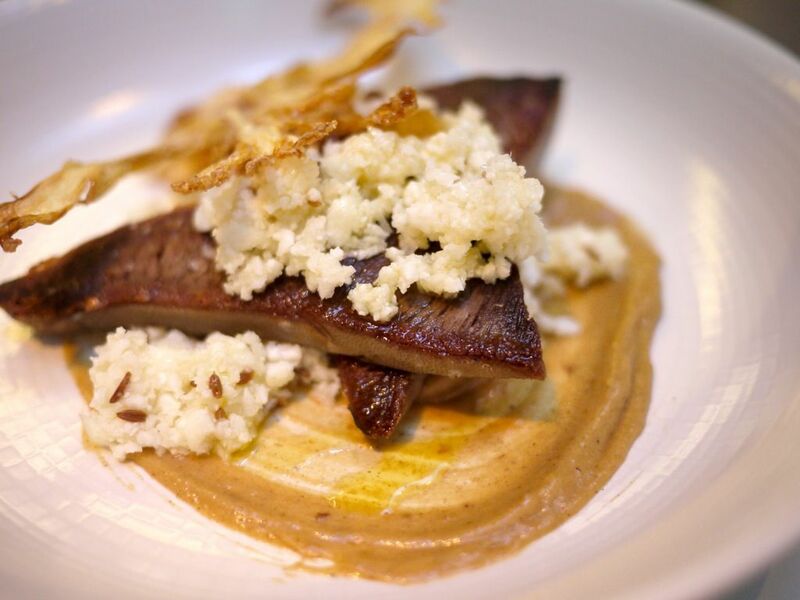 Grilled ox tongue on burnt cauliflower puree, cauliflower crisp & couscous, sherry jelly ($23). I love tongues. My first experience was in Tokyo and we had this thinly sliced ones done the yakiniku way. This is a little thick and hence you get more of that chewiness and fibre, and the slight metallic taste. We adored how the cauliflower was prepared though. 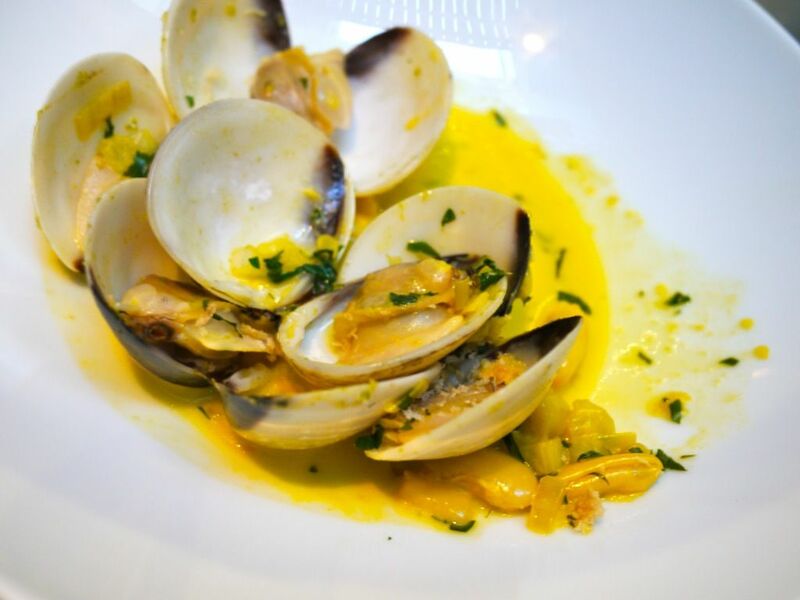 Sauteed clams, saffron white bean stew, lemon parsley gremolata ($22) is one of the hot favorites though i couldn't understand why. Granted the seafood is fresh but the preparation and seasoning didn't leave any impression on me. Perhaps my tongue was assaulted by the saltiness of the other dishes so much i couldn't taste this. Maybe? Would i be back? Sure. Esquina is a must try. I would say 2-3 dishes should fill you up, more if you are greedy. They don't take reservations, so go early especially on a fri/sat or be prepared to wait in line.